Laundry is one of my least favorite things to do around the house but I do appreciate warm clean clothes and cozy clean sheets. Today I wanted to share a couple little tips that I have to boost laundry. 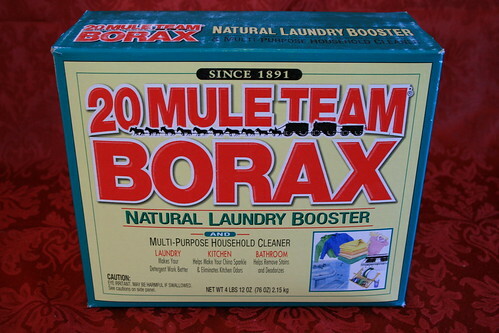 Borax – I started adding 2/3 cup of borax to my towels, t-shirts, and underthings. It is really making a difference! Old stains are disappearing or becoming less noticeable and whites are getting whiter. I haven’t tried this with any clothes I consider important like work garments or jeans, but for anything I wash with hot water, this is a great boost. A box is rather inexpensive, around $3 or $4 at Target. Dryer Balls – I have two spiky little dryer balls that I keep in my dryer. It mixes up the clothes and helps them dry faster and softens the clothes. I haven’t used fabric softener since I ruined a good work shirt and this is an easy and inexpensive tip. Vinegar – Is there anything vinegar can’t do? Add 1 cup of vinegar to a load of laundry to soften and brighten your clothes. I’ve also read that it can help set colors in clothes to prevent fading, but haven’t tried it myself. Dish Soap – Have you ever spilled oil or salad dressing on your clothes? I have all too frequently. My tip is to soak your garment in dish soap, give it a little rub on the spill, and wash the following day. Be sure to hang dry to ensure that the stain is gone. I’ve saved a few tops from certain stains this way. I think the key is to get your clothes in the soapy water as soon as possible. Do you have any laundry tips? I’d love to hear your tips and tricks.